From its endless rolling hills to its gorgeous beaches bathed by the sparkling Adriatic Sea, there is lots to do and see in the Central Italian region of the Marche. To get you started, here is a shortlist: medieval hilltop towns, stunning underground treasures, important religious sanctuaries, and nature reserves. 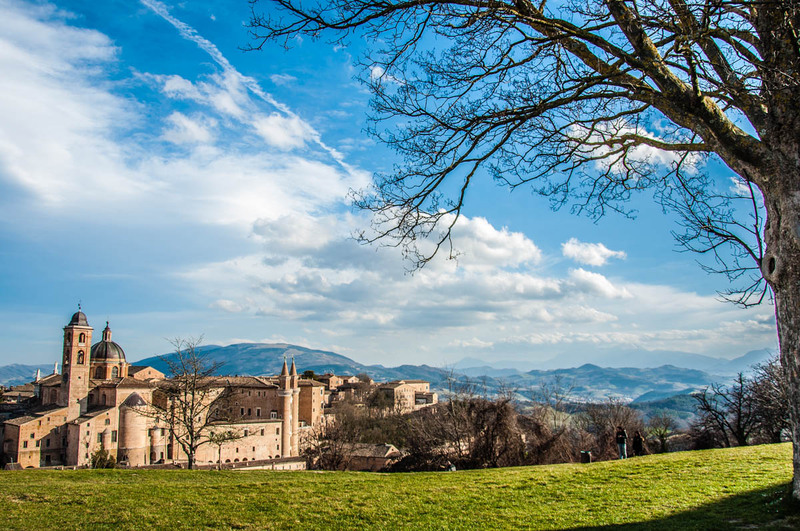 Plus Urbino – a city where you can get truly close to the heritage of the Renaissance. Suddenly, the Marche looks like a destination you cannot miss in Italy. And while every year close to 14 million tourists stuff themselves like sardines in the adjacent region of Tuscany, the Marche attracts seven times fewer visitors so it offers not just an incredible array of sights but also the breathing space to properly enjoy them. 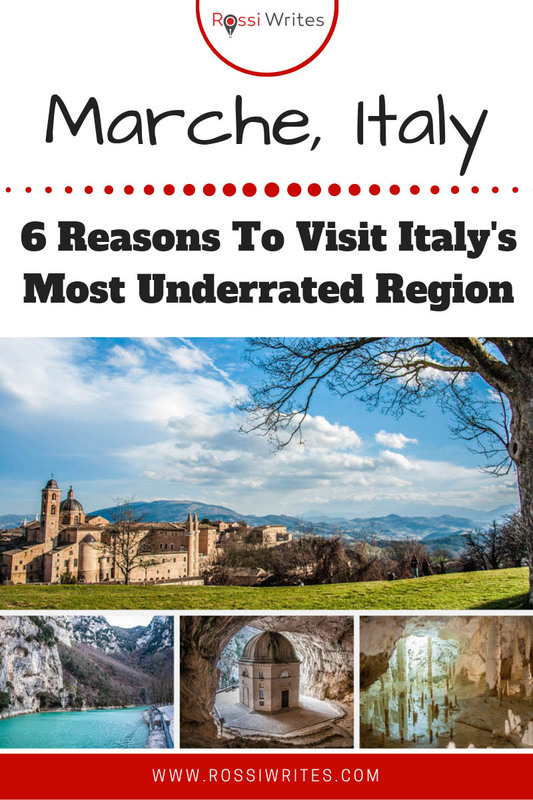 then make sure that you head over to the Central Italian region of the Marche pronto. Or even better, prontissimo. A few weeks ago I came back from an exciting road trip which let me experience for myself the beauty and the history of the Marche. 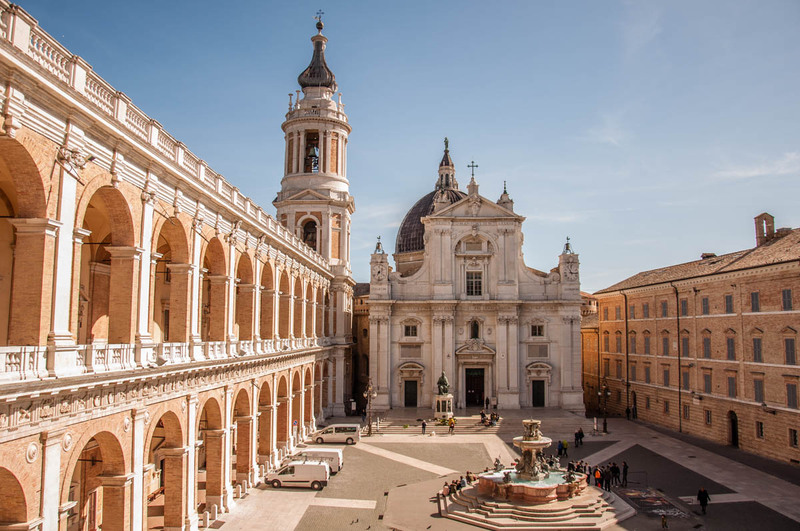 Together with my husband and little daughter, I spent four days exploring such soul-inspiring destinations as the Renaissance city of Urbino, the impressive Frassassi Caves and the hilltown of Loreto which is the keeper of one of the most precious Christian artefacts. I walked up a steep path to see for myself the perfectly designed octagonal Temple of Valadier which sits inside a small rugged cave. I admired the turquoise waters of the river Candigliano running through the Furlo Gorge. And I sunned myself on the postcard-perfect beach in Sirolo – a picturesque town on the Adriatic Sea. It was a vacation we had organised for ourselves at the very last minute and without much research into the Marche. Yet, a few hours into our adventure and I was already feeling full of energy and wanting to see more and more of the beautiful places we were driving through. Every day brought many exciting discoveries that made me fall in love again and again with the Marche’s art, history, and nature. So, if you have ever wondered if you should visit the Marche, Italy, here are six reasons to make you pack your bag and go there. This year, this month, today… The sooner the better! Over the centuries the Central Italian region of the Marche has been home to ancient civilizations, warring medieval lords and refined Renaissance rulers. Sandwiched between the regions of Emilia-Romagna, Tuscany, Umbria, Lazio, and Abruzzo on the landside and the Adriatic on the seaside Marche’s rolling hills have been attracting settlers since the dawn of time. Priceless finds like the prehistoric Frassassi Venus – a tiny statuette which is around 28 000 years old – are a testament to the layers of history that run deep here. Nowadays, the original statuette is kept at the National Archaeological Museum of the Marche Region in Ancona, whereas a copy of it is on display in the Art Museum of Genga close to the original place where the Frassassi Venus was found. 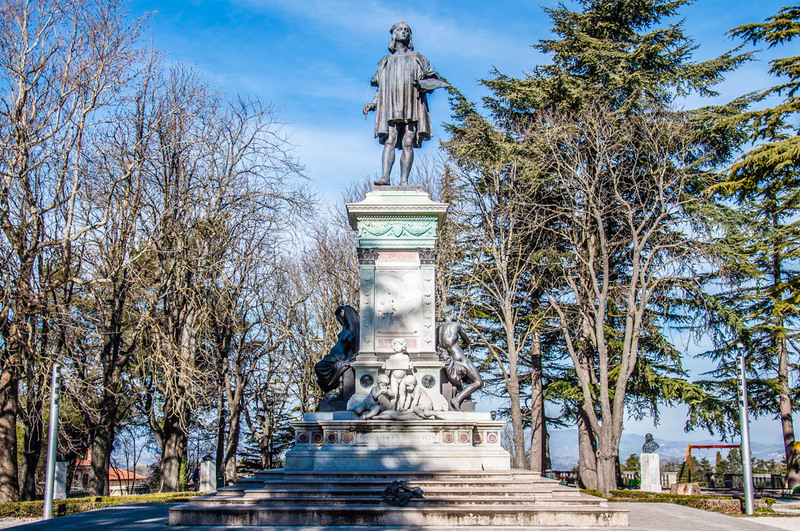 History enthusiasts will be in their element in the Marche, Italy exploring the artefacts and the monuments left there by the Italic tribe of the Picentes, followed by the Etruscans, the Greeks and the Romans. 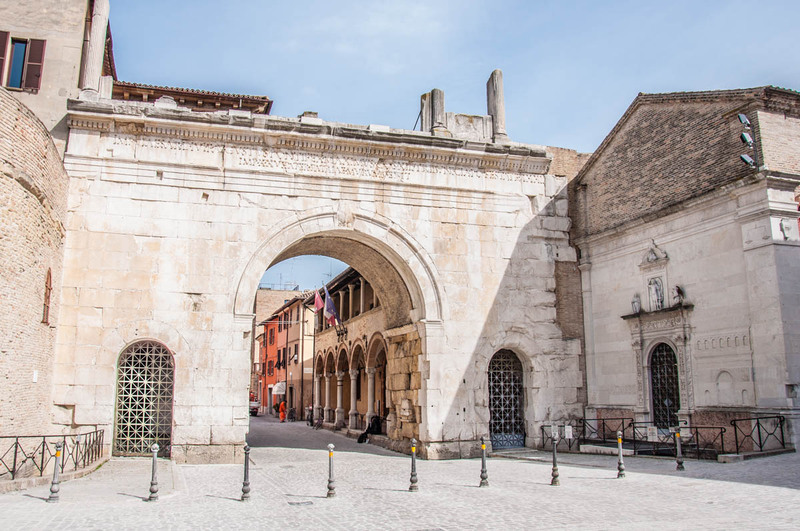 Two important Roman roads – Via Flaminia and Via Salaria – connected the territory of the Marche to Rome, the imperial capital, facilitating the trade and the movement of people. For example, Via Salaria – which used to cut right across the calf of modern-day Italy – took its name from the Latin word for ‘salt’, a vital and expensive commodity at the time. 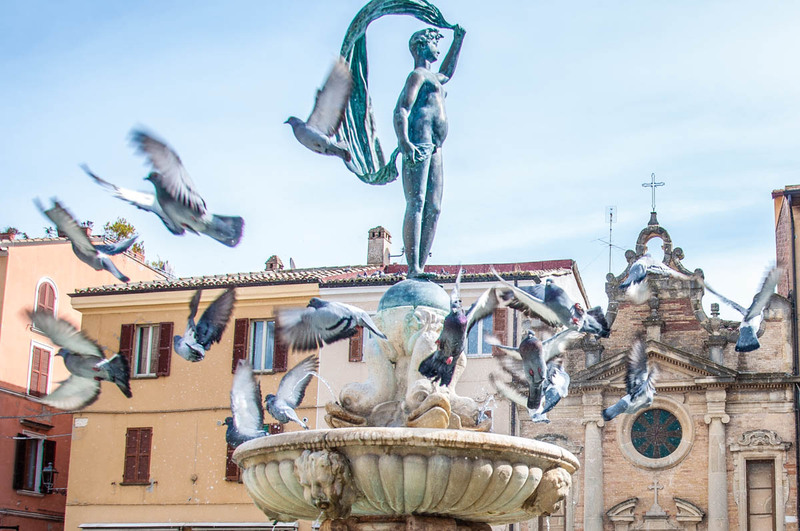 Fano – a charming sea town in the Marche – was one of the largest Roman settlements on the Adriatic coast and today has a host of Roman relics to explore. One of them is the triumphal Arch of Augustus which used to be the entrance to the city by the Via Flaminia. The Middle Ages have also left their imprint in the Marche, Italy. Picturesque hilltop towns are sprinkled all over its territory. With their mighty defensive walls and powerful castles, they are a sight to behold as you drive through this picturesque Central Italian region. A special mention here deserves Gradara – a fortified town just a step away from the border between the Marche and the Northern Italian region of Emilia-Romagna. Gradara is the setting of one of Italy’s most famous love stories – that of Paolo and Francesca – which was also immortalised by Dante in his Divine Comedy. Even a short visit to the Marche is enough to bring you in close touch with the exciting history of the region. Every sight tells hundreds of glorious stories. Every small and large museum holds a collection of curious finds. For example, did you know that the Romans, just like us, used to grate their cheese?! You have to see the Roman cheese grater in the Speleopaleontological and Archaeological Museum in the Abbey of San Vittore alle Chiuse in Genga to understand that our modern times owe a lot to the past. The Central Italian region of the Marche holds in its embrace Urbino – one of the major centres of the Italian Renaissance. Head to this lively University town of tall stone houses and narrow cobbled streets to enjoy some world-class Renaissance architecture and art. 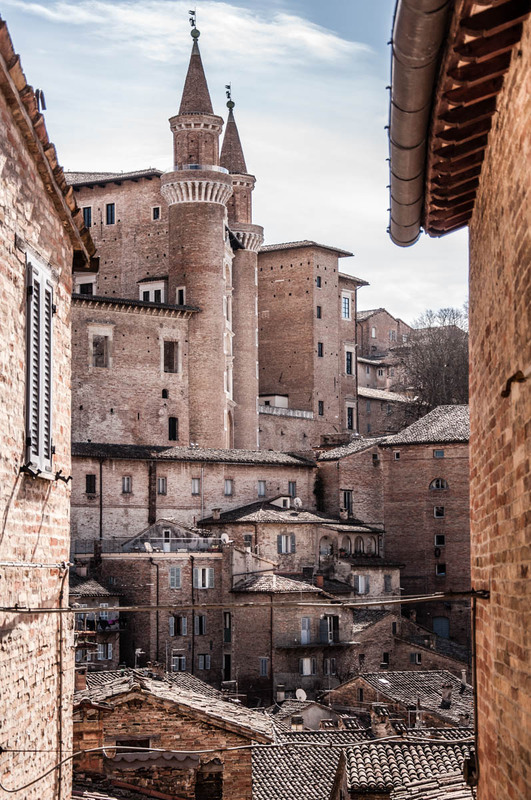 While there, find out how the rapid development of mathematics, geometry and technology in Urbino led to the city being known today as the Silicon Valley of the Renaissance. After all, the study of the sciences was greatly stimulated in Urbino, especially by Federico III da Montefeltro – the city’s 15th-century enlightened lord and duke. During his and his descendants’ time, Urbino had a small but important court. It was a centre for literary culture and at one point it was even proclaimed as the model of the virtues of the Italian humanist court. In addition to this, Urbino was the birthplace and playground of several notable Renaissance personalities. Among them was Raphael himself. Known in Italian as Raffaello Sanzio da Urbino he was an illustrious painter and architect, whose works grace the Vatican Palace and many prestigious museums all over the world. Raphael was born in Urbino in 1483 and nowadays his birth house is a must-see even on a short visit to this elegant city. Piero della Francesca is another important Renaissance figure with close connections to Urbino. An Italian painter but also a renowned mathematician and geometer, his paintings make fabulous use of perspective and geometry. Urbino was a fertile ground for many illustrious scientists, too. Among them, a mention deserves Luca Paccioli – a mathematician who wrote prolifically on topics like arithmetics, accounting and proportions. The city was the crosspoints at which mathematics and geometry met with architecture and art. A prime example of this multifaceted communion of ideas and techniques is Urbino’s Ducal Palace which was recognised as the symbol of the Renaissance’s ideals of harmony. 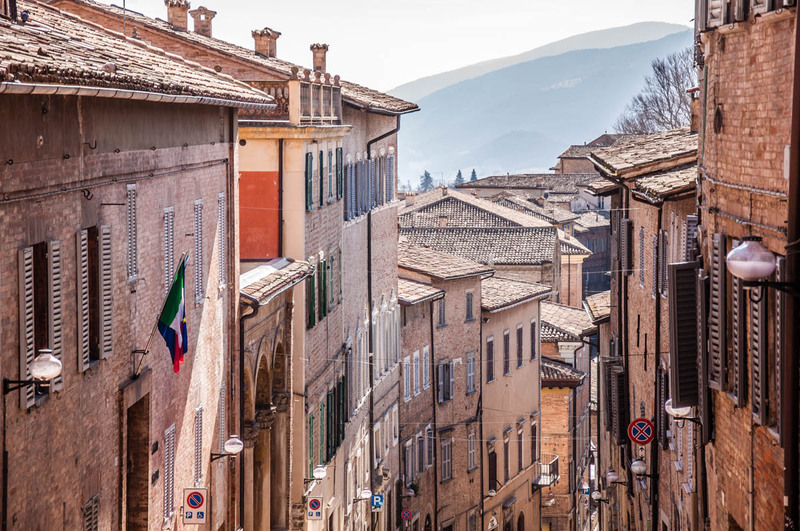 Head to Urbino in the Marche, Italy if you want to learn more about the Italian Renaissance and to thread in the steps of some of the most important and most creative personalities that influenced our world in many significant ways. Loreto is a small hilltop town in the Marche, Italy. Driving past it, you may be like: ‘Oh, I don’t need to stop here, as there are dozens of other cute as a button hilltop towns within an hour’s drive!’. Yet, don’t give Loreto a miss. One of the most precious Christian relics is kept in the town’s Basilica of the Holy House and thousands of people from all over the world flock there to see it for themselves and to pray in it. The Annunciation is one of the greatest Christian events. The angel Gabriel appeared to Mary in her house in Nazareth to announce to her that she would conceive and become the mother of Jesus. Nowadays, Mary’s Nazareth house is in the town of Loretto in Marche, Italy. Nestled in a lavishly decorated marble shell in Loretto’s Basilica of the Holly House, it can be visited for a quiet moment of devotion and prayer. It is, without doubt, one of the most important sanctuaries in the world no matter what your religious beliefs may be. Finding out that you are expecting a child is a life-changing moment and the Holy House of Loretto is a place, at least for me, where you can feel both how very human and how utterly divine this moment is for every mother. How the Holy House reached Loretto from Nazareth is another very interesting story which is recounted in the adjacent to the Basilica Museum-Art Gallery of the Shrine. From the popular belief that the house was carried from Palestine to Italy on the wings of angels to the story that it was transported on a boat by a family called Angeli, it is quite elucidating to spend a bit of time there and find out for yourself where myth and reality collide. The Temple of Valadier is another religious sanctuary of great interest in the Marche, Italy. Known also as the Church in the Cave, it is just that: an octagonal church built in the mouth of a rocky cave in the face of a steep cliff. Inaugurated in 1828, it was designed by the celebrated Roman architect and urban planner Giuseppe Valadier and commissioned by Pope Leo XII who was born in the nearby medieval village of Genga. Right next to the Temple of Valadier is the Sanctuary of Santa Maria Infra Saxa which has been attracting pilgrims for over a thousand years. Visiting the Temple of Valadier and the Sanctuary of Santa Maria Infra Saxa in the Marche, Italy is a beautiful experience. If you find yourself there around Christmas, you will also be able to see the annual Living Nativity which the local people set up with great enthusiasm along the path leading to the temple and the sanctuary. The Living Nativity recreates in great detail the town of Bethlehem as it was two thousand years ago. Long before the advent of Christianity though, the lands of Marche, Italy were populated by ancient tribes. Traces and relics of their religious practices can be found all over the territory of this Central Italian region. For example, in the archaeological area La Cuma, near Monte Rinaldo in the Marche, you can see the remains of a Greek sanctuary and a Roman temple. The most tantalising thing about the region of the Marche in Italy though is that as beautiful as it is on the surface, many of its treasures are, actually, underground. From stunning natural caves to mighty man-made structures excavated underneath the region’s cities and towns, the Marche’s most intriguing facet is the one that is hidden beneath the surface. 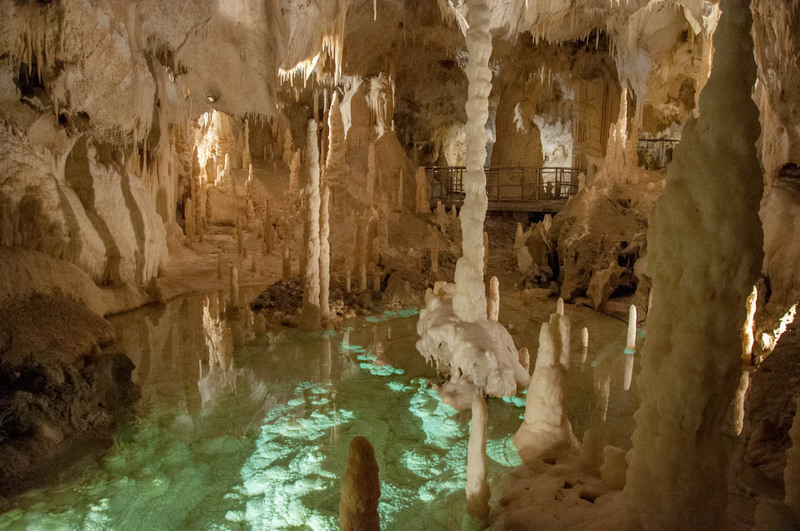 The Frasassi Caves are, indeed, Marche’s most precious underground gem. Discovered in 1971, this karst cave system has a series of breathtaking rooms. One of them – the so-called Ancona Abyss – is so cavernous that Milan’s Duomo can fit inside it without any problems. The Frasassi Caves are open for visitors and are a pleasure to explore on a guided visit. Its rooms are lined with thousands of stalactites and stalagmites. Several crystal clear ponds are dotted along the way. Whimsical formations catch your eye at every step and turn. The stories told by the guide about the discovery and the exploration of the caves awake your curiosity about what’s hidden underground. Plus, you cannot help it but laugh when she points to the Pancetta Slice and the Lard Slice – two of the most famous formations in the Frasassi cave system. The land of the Marche, Italy also hides several man-made underground facilities. 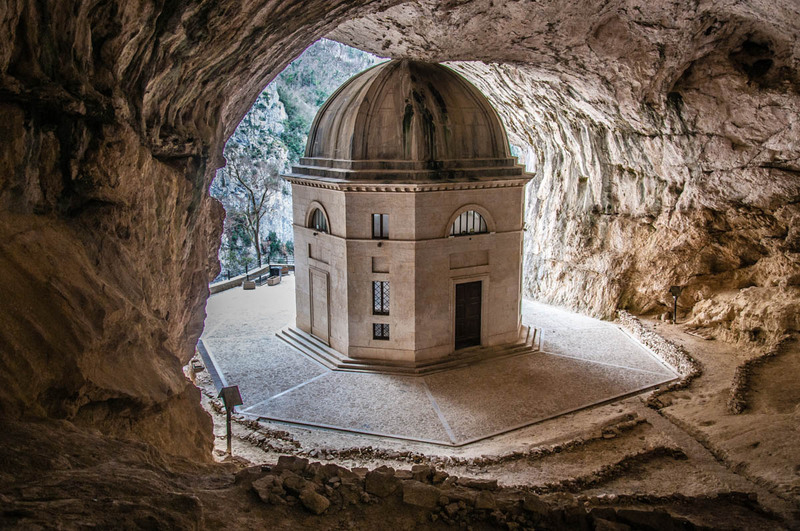 The towns of Fermo, Camerano and Fano, to mention but a few, give you a chance to explore some of the most intriguing underground structures in Europe. In the town of Fermo, you will find the largest ever Roman cisterns (in terms of their surface area). They were built in the 1st century AD. The cisterns can still be visited. They comprise 30 rooms divided into three lines and have an area of 2200 sq. m.
Camerano is a small town next to Mount Cornero and the Adriatic Sea. In Camerano, you can visit a mysterious underground town which was built in ancient times by the Picentes tribe. The galleries, tunnels and niches there are decorated with bas-reliefs, friezes, and religious symbols. The town of Fano in the Marche, Italy is the modern-day embodiment of what originally was the Roman settlement of Fanum Fortunae. There are many Roman relics there, many of which are beneath the surface of the town’s infrastructure. You can go on a guided tour of the underground archaeological area and see such exciting things like the Roman amphitheatre and the Roman marketplace. The Marche, Italy is a dream destination for everyone who is passionate about hiking and exploring unique sights of natural beauty. This Central Italian region is covered by an extensive network of hiking paths and a large number of nature reserves. It’s easy to get close to nature here. For example, the region’s capital – Ancona – is only 15 km away from one of the most important protected ecological areas in the Marche – the promontory Monte Cornero. Just shy of 600 m in height, Monte Cornero overlooks the Adriatic Sea. It is the only coastal high point from Triest up north all the way down to the Gargano Massif in the region of Apulia in the south of Italy – a distance of about 850 km. 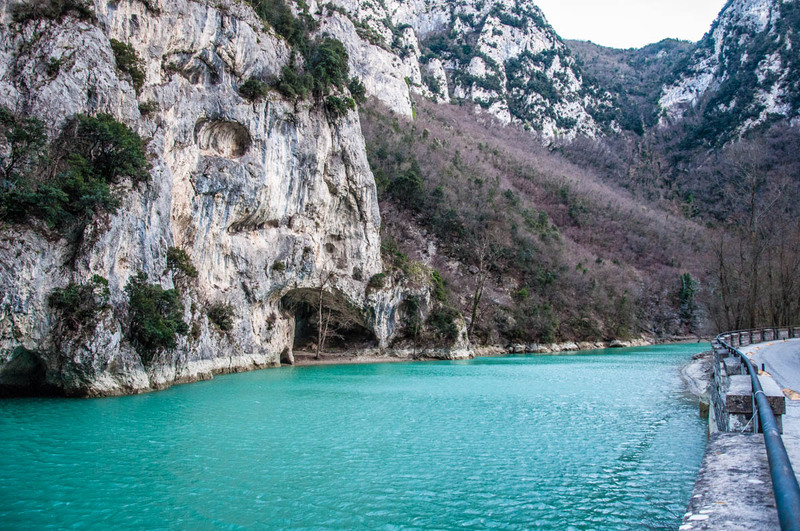 Gola del Furlo is another gorgeous natural sight in Marche, Italy. This is a gorge on the ancient Roman road Via Flaminia. When you drive through the gorge, the road actually takes you through a Roman tunnel. It was built at the narrowest point of the gorge on the orders of the Roman emperor Vespasian. The most impressive thing about the Furlo gorge though is the colour of the river Candigliano which runs through it. Its waters are an intense turquoise shade which is offset beautifully by the greens and greys of the surrounding cliffs. The Natural Regional Park of Gola della Rossa and Frasassi is a paradise for hikers and rock climbers alike. The rocky cliffs, the thick forests, the sulphur springs; it is a wild and beautiful place with not many people around thus giving you the peace and quiet you may be craving. Sunny sandy beaches are Marche’s trademark. The sparkling Adriatic Sea is invitingly blue and very clean. As soon as the temperatures reach sun-worshipping levels, the small towns of Sirolo, Numana, and Portonovo get swarmed by people eager to work on their tans. Just up the road from there, you’ll find the beaches of Pesaro and Fano which offer all mod-cons for a family seaside vacation. It doesn’t matter if you are looking to spend some lovely beach time with all sorts of bars and restaurants within an arm’s length or if you prefer wild beaches that are difficult to get to so that you can combine some hiking with your beach time. Marche certainly offers both types of beach adventures in addition to a lively beach nightlife. 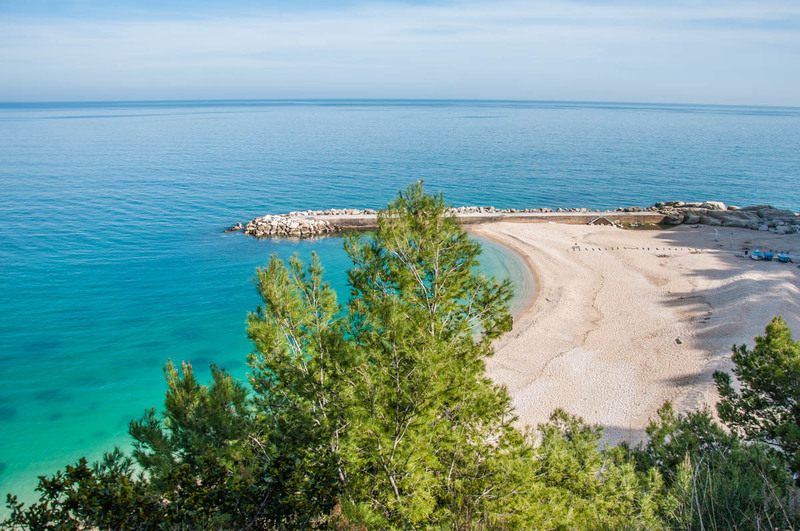 In total, there are 16 Blue Flag beaches in the Marche (according to data from 2018). 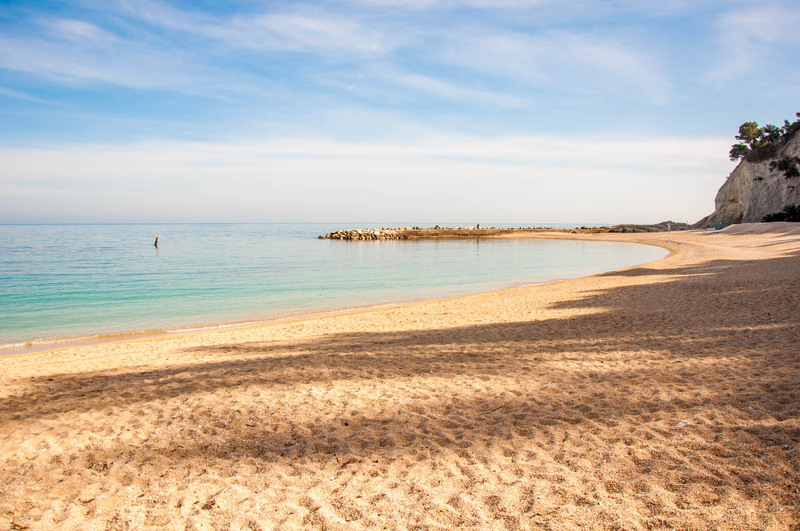 This makes the Marche the fourth Italian region with the largest number of Blue Flag beaches. It’s preceded only by Liguria, Tuscany, and Campania. You can have a look at the full list of Blue Flag beaches both in Marche and the rest of Italy at this link (in Italian but it’s easy to orientate yourself). 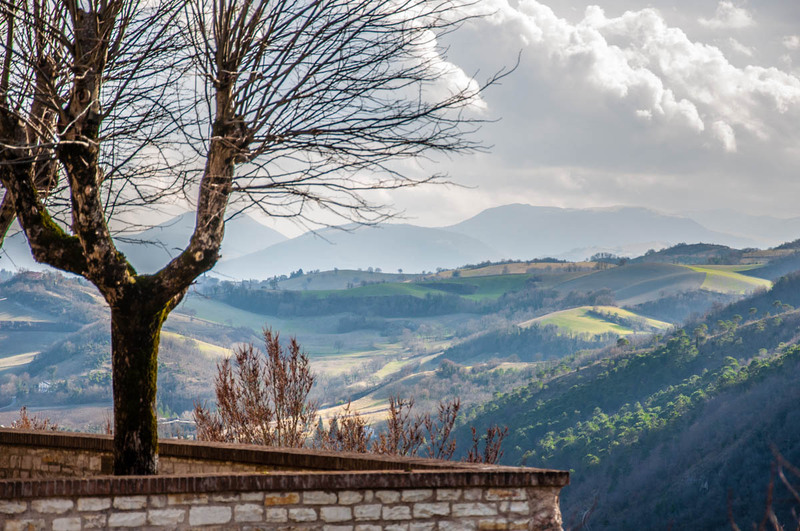 In March 2019, I spent four very full and happy days exploring the Central Italian region of the Marche. It was a bit of a spontaneous road trip that my husband and I organised for ourselves at the very last minute. In light of how many travel blogs write about sponsored trips exalting the virtues of lands that they have been paid to visit, I hasten to add that in line with my blogging policy, our exploration of the Marche was not sponsored by anyone in any way. We paid for everything ourselves, did our own research and chose our own destinations. Hence, the impressions and tips I share here with you, are all my own and not influenced by anyone or anything. We had a great time getting to know the Marche and discovering its many secrets, sights and beauty spots for ourselves. In four days, we walked the cobbled streets of Urbino, hiked on Monte Cornero, visited the Frasassi Caves, drove on winding roads taking us across an infinite number of green rolling hills, explored many museums, Roman ruins and Christian sanctuaries, admired the dexterity of a group of windsurfers in the Adriatic Sea, and even sunned ourselves for a bit on a deserted beach covered with fine golden sand. The Marche left me with so many beautiful memories and a desire to return again – for much longer next time – so that we could see more of this underrated region of Italy. The places we managed to visit over four days (sometimes for an hour, sometimes for a whole day) were: the Renaissance town of Urbino, the medieval village of Genga, the Frasassi Caves, the tiny hilltop village of Pierosara, the Temple of Valadier with the Sanctuary of Santa Maria Infra Saxa next to it, the Furlo Pass and Gorge, the Natural Regional Park of Gola della Rossa and Frasassi, the beach towns of Sirolo and Numana, the hilltop medieval town of Loretto and the formerly Roman town of Fano. It was beautiful and enriching, too. If you ever have a chance to visit the Marche, don’t miss it. Even better, create an opportunity yourself to travel to this exciting place where history, art and nature meet off the beaten track. Marche is a Central Italian region on the Adriatic Sea and next door to Emilia-Romagna, Tuscany, Umbria, Lazio, and Abruzzo. It has a rich history going back thousands of years, beautiful nature and a host of underground treasures – both natural formations and man-made structures. Marche is easy to visit from the adjacent Italian regions. Ancona – its capital – also has an airport which is served by low-cost flights. A truly underrated and often overlooked part of Italy, the Marche offers lots of options for a great short or long holiday. Beaches, mountains, culture and history – everything is at an arm’s length. Have you been to the Marche? What was your favourite destination there? Let me know in the Comments section below?! If you haven’t been to the Marche yet, please, let me know which Italian region has truly captured your heart! For more useful information like this, please, like my blog’s page on Facebook and subscribe to my weekly strictly no-spam newsletter.